So here we are . . . Day 1!!! 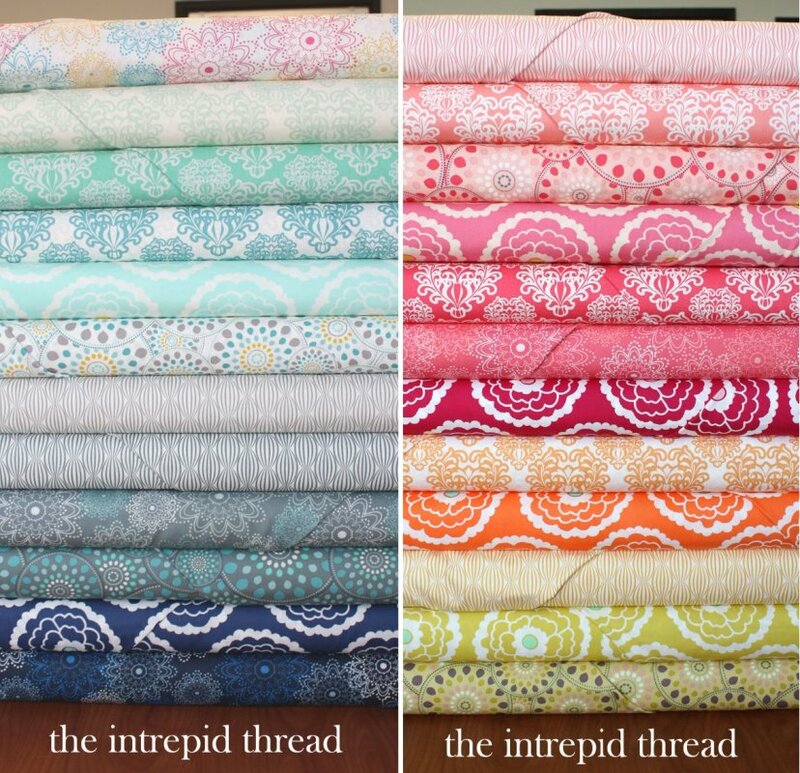 Today's giveaway is sponsored by The Intrepid Thread. Thank you so much to Julie for her wonderful sponsorship of today's amazing giveaway!!! Now you all picked a some great things that you loved from Julie's shop. Some of the favorites included . . .
A Complete Ansonia Fat Quarter Bundle!!!! This is such a beautiful bundle!!! It would be the perfect Mother's Day edition to anyone's stash :) So what do you have to do for a chance to win this amazing bundle?? Easy. My mom used to make Christmas ornaments with us each year. The two that stand out in memory are salt dough and beaded. My favorites were probably the ones where you alternated red and white beads to make a candy cane. My mom was a quilter, and we still have, and love, her quilts. And she hand quilted everything!!! Oooh, I LOVE this bundle! I have many memories of my mother and i crafting together. We didn't have much money for gifts so almost every gift we gave was handmade (the best kind, in my opinion!) Every year, a couple of months before Christmas, she would take each child, one by one, into a separate room so we could plan gifts for the others without them knowing. Then we would secretly work on our projects, often locking ourselves in a bathroom so no one could get a peek at what we were doing! Such fun times those were! My mother passed about 5 years ago and her birthday would have been May 1st the start of this give away. She and my godmother were sewer of clothes and they were the ones I leard to sew with. She was not around when I got the quilting bug, but I think she whould have love it as I do. Miss you mama. My mother is 89 now and has advanced dementia. I brought her home from the nursing home in October of last year. I fear her current behavior will color my memories, but her memories are of a happier time growing up on a farm in Illinois. One of the funnest things we did was for a Mother's Day potluck at school when I was preteen. We were supposed to bring a dish that reflected our heritage. Stumped mom because she didn't know anything about her ancestors. So we made two big bowls of 2 colors of jello. After it set, just before we left for the dinner we chopped each bowl up, made a divider for dixie cups and put two colors of jello in the cups. Pulled the divider, and instant Heinz 57 desert. It triggered the desire in mother to trace her ancestry which was an active hobby for her clear until her mind began to go. Here is to joy for our mothers, where ever they are. 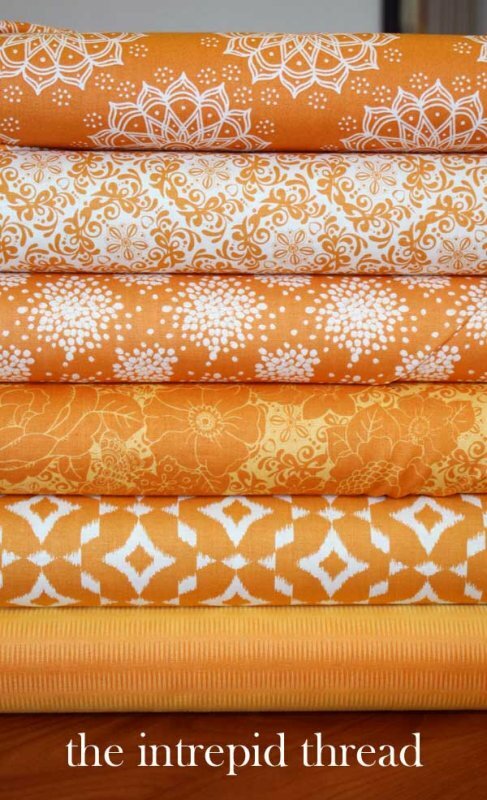 That stack of orange fabrics is to die for! My mom did not sew or craft. I did learn to sew in home-ec. Once I learned, my mom helped me in any way she could. My mom taught me to sew when I joined the 4-H club when I was 9. I made a blue and white dress, and mom made me rip out seams over and over and over again. I got so mad at her! Well, now I've been sewing for 50 years and I don't even mind ripping out seams from time to time. I thank her often for teaching me a skill that has become such an integral part of my life. My mother loved to sew, but she wasn't a quilter. She always wanted to learn, but she never had the chance. She is the reason I decided to learn how to quilt. I never dreamed I'd fall this in love with it, but I like to think that it would make her very happy that I'm quilting. My favorite crafting memory is every Christmas we would make salt dough ornaments. I would roll out the dough and cut them out and she would paint them. They were so beautiful! I wish I still had some! My mother was always crafty, sewing clothes for the 4 kids, making items for the church bazar, home décor, knitting - you name it. One summer in college I wanted to make a quilt for my then boyfriend and we spent the better part of the summer working on that quilt. The boyfriend and the quilt are long gone now and it was many many years later that I decided to give quilting a try again. Too bad mom is so far away now that we can't work on another one together. My mom taught me to sew when I was just 8 years old. She patiently sat with me and helped me sew a doll sleeper on my very first machine - a Cabbage Patch Kids sewing machine. Over the years, we sewed a lot of projects together. I still enjoy sewing with her today! I just put my mom on an airplane to go home. She came to visit for 2 weeks and we drove all over to different quilt shops and in between we worked on small projects. It was so much fun and it was so hard to let her go home. I used to always help my mum with her quilting by moving blocks around on the design "wall" and helping to choose fabric colours! My mom loves to tell the story of sewing in her large closet with baby me and a real bunny rabbit sitting next to her in a play pen for hours. We had that rabbit for 14 years and we were best friends. While I was too young to remember any of it I do have a picture that sits in a frame in my house. It's one of my favorite belongings. My mom taught me to sew and walked me through my first quilt, though she has only ever made one quilt herself. Now she doesn't do any crafty stuff, but she's teaching my soon to be sister-in-law to knit and crochet. Thanks for the chance to win. This should be a fun week! My mum and I still talk quilting for hours on the phone :) she helped me with my first quilt which I treasure ! My mum has always been crafty and I'm really happy that she has passed that down to me - thanks for the wonderful giveaway ! I also watched my mom sew as a child. I "assisted", handing needles, snipping threads. Now I have my own quilting business and my mom assists me. Pressing, piecing backs, etc. It's all come full circle! My Mother passed this February at the young age of 96. No a sewist she encouraged my growth. To this day I remember my first sewing machine as the highlight of my young life. My favorite memory of my mom when she taught me how to make my first quilt. The fun we had making it because the colors she wanted me to use were not what I liked but I used them anyway. We talked about this many times and when she was diagnosed with brain cancer I helped her make her last quilt which was a Sunbonnet Sue. She would get confused and put parts where they didnt belong and when she realized it we would sit laughing about it. I still have both quilts. Memories are precious. my mom is an amazing seamstress. me, not so much. i can always count on her help when i get stuck making a dress. when i first started quilting, i had no idea what i was doing, but my mom was right there to help me (even though she doesn't quilt much herself). My mom taught me everything that I know about sewing. I still go home and chat with her while we sort through her scrap bins! My mother, as wonderful as she is, doesn't have a crafty bone in her body; but my step-mother does, so I'll go with a memory I have with her. My parents split when I was very young and my father remarried when I was 8. MY step-mother made the flower girl dresses my step-sister and I wore in the wedding and the Christmas stockings we started using that very year. I was fascinated by the her sewing machine and she used to let me hand her pins and scissors while she sewed. It took me years (more like decades) to finally start sewing, but I truly believe my step-mother's craftiness sparked my own, although it manifested in knitting and cross stitch first. Thanks for the chance and Happy Mother's Day (a bit early!) to you! Mom was a home-ec teacher for the first half of her career, so I learned from the best! She'd roll her eyes at my to-sew and to-craft list that I'd write at the beginning of each summer... But she helped me anyways! A great memory i have of my mom is when i was in 2nd grade. We were so very poor that year. We couldnt even afford heat. I remember at that age being okay with no christmas. But i woke up that morning to some amazing crocheted barbie doll clothes, and a doll house she made from scraps of wood. Those barbie doll clothes ment so much to me. I still even remember the delicate ballet slippers she made. She taught me to value made above store bought. i still do! My mom didn't really sew but I remember going with her and picking flowers and choosing a special vase to display them in. My Mom is currently teaching me to quilt. She has a long arm machine that I hope to inherit someday. She gave me advice when I was shopping for my latest sewing machine. We have a blast together! I was raised by my grandmother who taught me how to sew on an old treadle sewing machine. She was as bad as I am now with hoarding fabric. I have tried to teach my Children the fun and crafts of sewing and it is fun to watch how they are teaching their children. My mom is adept at all things crafty. I love that we can talk all things quilting together. I have a quilt that my mom, my sister and my Grandma all helped me get started in my hand quilting frame. Those stitches are a wonderful reminder of some of the people I love. Well, my Mom was not a crafter but she loved to cook. I have great memories of baking cookies together and love that I still have so many of the recipes in her handwriting--tattered and torn, covered with spills. When I was in the 5th grade we had a choral program at school. My mother made me the most beautiful green and white long dress with a ribbon belt to wear for the program. No one else had anything like that dress. I may not have always appreciated homemade clothing then but now I realize the love and care that was put into each stitch. Thank you Mama! I don't think my Mum really enjoyed sewing but I remember her making all my costumes when I was doing calisthenics, stitching tutus, hats and countless, zillions of sequins all stitched on by hand. She must have really loved me! Sadly I lost her way too early and still miss her every day 23 years later. I lost my mom 7 1/2 years ago when she was 92. I remember her showing me and taking such pride in her hand piecing of scrappy Kwilts. Nothing fancy and all were utilitarian long before scrappy was cool! She made one for all her kids, grand kids and so on. I miss her so much, everyday! My mother was a seamstress. She very patiently taught me how to sew. Now that she is older and more feeble, I have been able to sew quilts for her. The first time I showed an interest in sewing (at 15) my mom took me to the fabric store 45 minutes away almost as often as I wanted. On one trip she decided I needed a sewing machine at home and let me pick out one. I later learned that she hated sewing, but wanted to make sure I had the tools to learn and create. Our mother taught my sister and I to sew and knit over the years. She made a lot of our clothes. We never got just a dress made for Easter because we lived in Pennsylvania. Because of that our dress always came with a matching coat always in a pretty pastel color. It was Spring after all even with snow on the ground! My mom didn't craft at all, but my grandmother used to spend lots of time teaching me to crochet. Her specialty was to crochet over wire hangers so your clothes wouldn't slip off. She is dearly missed! I don't crochet at all but I have fond memories of working with Grandma and now I quilt with my daughters. My mom is a crafting guru...always setting up tables at craft fairs. I only see her in the summer, and we always craft together, this past summer we made Scrabble Tile necklaces and had a bunch of fun doing it! My mom is 86 years old and still sews although not as much as she used to. We have taken classes together over the years including tailoring, quilting, chair caning, stained glass, and quilting again. She is always available for a "quick" run to the quilt store, even one in another state! When I was in high school, we sold our crafts that we made at craft fairs. Lots of fun! My mom is not crafty whatsoever, so she is always saying to me, "I don't know where you get this from". While she was down here visiting with us for the winter, I was working on finishing up my first paper piecing project from a Judy Neimeyer class that I had recently taken. She fell in love with what she had seen. While I had every intention on keeping this quilt for myself, I decided that when it gets finished, it really needs to go live with my mom. I love her support of my quilting. My mom was never into sewing, so we never sewed together or anything. But when I told her that I wanted to learn to sew, she drove me to classes, bought my fabric and she still supports me wholeheartedly! Oh goodness - my mom was not a crafter in any sense of the word. Except she did love to knit in the evenings as she watched tv. I still have an afghan that she made for me oh so many years ago. My mother never had a lot of confidence in her abilities. I remember one time how she showed one of my friends a sewing technique that the home economy teacher couldn't help her with. I was so proud of her and realized she knew a lot more than she gave herself credit for. My Mother also made all my clothes and my Barbies clothes too. If I saw something at the store that I liked my Mom would tell me the she could make it and she did. My Mom has never been a crafty person. She recently (at age 82) learned to crochet and she can make minor repairs (sewing up holes, hemming) to garments. Her place of glory was the kitchen. She was absolutely the best cook in the county and I remember Sunday lunch being a big deal because everyone from church wanted to be invited to our house to eat. Sadly, she rarely ever cooks anymore because she is 85 and has dementia. She now forgets what she has added to anything she is cooking and often forgets that she has something on or in the stove. Some of the things she does now are often quite funny. Recently she made a cream cheese pie and instead of adding a can of pie filling to the top, she placed marachino cherries all over the top! My mother taught me to sew when I was 10. One thing that I still remember is that she always did the ripping when I made a mistake. I had to resew, but she would do the ripping. I repeated that when I taught my granddaughter. It helps encourage rather than discourage young sewists. My first real memory of sewing is my mother sewing my Halloween costumes and stuffed toys (bunnies, bears, and raggedy ann and andy's). I often won the costume contest a in elementary school, beating the store bought costumes. It really helped me as a child to appreciate the awesomeness of these skills. I learned that I can make anything I dreamt of and it was likely to be higher quality than store bought options. When I was little my mum used to sew me dresses. There was one lemon dress in particular that I will always remember as she went all out to get it finished for me to wear to a birthday party. I was a little late for the party as a result but I got to wear that dress and I cherish that memory to this day. My mom was not a crafter or sewist. Her forte was shopping. My mom could sniff out a bargain from 50 ft. away. She never paid full price for anything. 75% off was her style. We had the best time shopping together and then going out to lunch. My mother made all of our clothes (7 siblings) since we were small, often the same dress for all, and until we were old enough to make our own. I think the same outfit for six of us was my impetus to learn to sew my own clothes so that I'd have something all my own. Mom started me sewing when I was 12 years old and I've never stopped. Mom taught me many needlework crafts and encouraged me to try those that she did not know. Thank you Mom. My mom taught me to sew, and was always there it help put in the zipper when I got frustrated. We still like to sew thing together. My mom started teaching me how to knit at 5 years old. With her help I've made and entered a few things in the fair through 4-H. And even got one of my things entered in the state fair. Mom taught me to sew; the most poignant memory I have is ripping, ripping, ripping. She taught me to sew accurately and neatly or else the seam ripper would come out! That influence is what makes me a great piecer of quilts! My mom made lots of our clothes, all on my grandmother's Singer featherweight, which I now own. The best thing she made for us in the 70's was ponchos with fringe on them. Loved that thing! I so desperately wanted to be a black cat for Halloween in 2nd grade. My mom made me a costume, her first and last. Loved it! I remember my mom sewing matching out fits for my sister, herself and me. She sewed many of my dresses when I was growing up as well as knitting. I guess that is where my craftiness comes from. I don't know how my mom had time for crafts with 4 kids all within 4 1/2 years. She and my aunt did all kind of crafts and sewing projects through the years. I definitely know where I got the 'crafty gene'. My mother is 92 and still going strong. This weekend we were cleaning out some items and found the 2 flower girl dresses that she made for my daughters wedding. She made the dresses and I sewed on all the tiny purple bows on the skirt. She made all the dresses for all 3 of my daughters weddings but these 2 little masterpieces were always her favorite. She isn't ready to part with them yet, but finding them brought back good memories. My mom was not a crafter (she was a musician and a wonderful pastor's wife.) She died of Alzheimer's in 2009 and one of my favorite memories is during her last couple of years, sitting in rockers on her porch in Tennessee, me hand-quilting, and her just enjoying being outdoors looking at the flowers and trees. We spent hours that way and it makes me smile thinking of it today. My mom sewed for me all my life growing up! She taught me the basics when I was bout 12. Then I took sewing in high school for three years and taught her some things! We have always loved creating things, and have pretty much tried everything from tole painting to knitting to paper crafting. Today she (at 76) is still the master knitter and I am now a crazy lover of quilting! My favourite memory with my mom craft-wise is working on my wedding dress with her 8 years ago. We were just talking yesterday about us girls learning to sew - she says my sister and I have long passed her skill level but I sure appreciated her help with my gown! All those rolled hems on organza overlays! She taught me to sew at age 5, just zigzagging old towel pieces as cleaning cloths! We used to crochet squares together for blankets, such a fun project!! Thanks for the chance to win! My mom made all my clothes when I was a child. She gave me all the scraps and helped me make clothes for my dolls. I thought she was just helping but really she was teaching me dressmaking. We had such fun sewing together. My mother isn't very patient when it comes to sewing, so my favorite crafty memory was making chocolate candies with her. We used to melt the colored chocolate discs and then paint the molds using a toothpick! The finished candies were gorgeous and it was so much fun. My mother has always been very supportive of arts and crafts, too (even if they weren't something she enjoyed doing herself). One year she let me paint a giant dinosaur on the side of our shed. It became a bit of a landmark (we lived out in the country so it really stood out!). My mother loved to sew and when I was little (I think 5), we would go to embroidery classes together. I was always interested in her sewing machine and she wanted something less complicated for me to work on with her. Those classes are one of my favorite memories. The first class we got these cute little butterfly thread organizers, which I love. I still have both of them. My mother sewed on a treadle machine until I was twelve, and she had great legs! She taught me to sew by having me do all the stay stitching on her garments. my Mom and I did craft shows together and she made pictures from pressed flowers so summer was spent finding flowers to press. and then those long fall days at the craft shows selling. My mom helped me make both of my prom dresses. One of them I was in charge of, and she just helped me read the pattern when I was confused and put in the zipper for me. The second one I cut all the pieces and she sewed for me (it was Thai silk and we were both afraid I would destroy the fabric). I loved those dresses for themselves, and loved them all the more because my mom helped me make them. My mom always had me make pajamas for the little kids she took care of. It was always a lot of fun. Mom was an AMAZING seamstress! She made MANY wedding and prom dresses. I loved knowing if I had a music contest or dance or was in a play I was going to have a one of a kind creation made by Mom. My favorite was when she made a dress for one of my girlfriends. Personal story here! Tracy was... rather large up top! She was not a big girl but God OVER blessed her! (She had a reduction soon after graduating high school) anyway. Mom made her prom dress our Sr year. Because she wad so disperportioned Tracy never DREAMED of having a dress that fit let alone a STRAPLESS! Mom boned the bejesus out of this dress! I remember Tracy trying it on and jumping up and down and she CRIED because it FIT! and didn't fall off! And she looked BEAUTIFUL! Sewing was not favorite, my mom was a knitter. She was always knitting, sweaters and socks. She loved it to knit for the grandchildren. Thanks for the chance! What a great give away! My Mom crafty? No way, no how! Thankfully my grandmother was a quilter and always making crafts and baking. She still lives through me. Girl Scouts. My mom was my troop leader and we always tie dyed our troop shirts so making new shirts with her every year is something I will always remember. My mother made me THREE prom dresses. Since she "knew how to sew," I just assumed they were fairly easy for her. Now that I sew, I can't believe she did it - I'm overwhelmed by the love that went into those difficult projects. My mom is not much of a seamstress. She doesn't enjoy it all that much, and as a kid it always seemed to me that she was gritting her teeth and defeating that material, rather than enjoying sewing it up. That said, any time I came to her with a need for something sewn up she took it without complaint and never said "no". Now I really enjoy sewing things for her - she's always amazed at what I can do! My mom has never done any sewing or crafting of any type. So, growing up, she was not so much an "inspiration" as a "supporter" of my efforts. I have been giving my mom hand crafted gifts from the time I was young and she is always the first to point out, "My daughter made me this, etc". I can feel the love and pride she has for me by the soft quiver in her voice as she shares the things I have made. My mom was a wonderful seamstress; she made me the most beautiful dresses when I was a little girl. But my favorite memory of us together crafting - When I was a teen, all of our female cousins, aunts and my grandmother used to get together on Mondays and craft. I loved going with Mom and all my relatives. Such fun and laughter! I miss my mom every day. She will be gone 25 years the day before Mother's Day. My mom was not very crafty (luckily my dad was!) but my mom was a good cook and baker. I remember making my 12th birthday cake with her - a triple layer chocolate cake that seemed so impressive and wonderful! My mom stuck dry spaghetti through the cake from the top to stop it from sliding after we frosted it. Genius! One day many years ago, my mom wanted to do some needlepoint. She had done it as a child back in the old country but I had never seen her do it. We went to the big department store and chose a canvas and all the yarns that went with it. She taught me how and then both of us worked on it. Once it was finished she got it framed. It's great and she had it hanging on her bedroom wall for years. This past March, she passed away but I now have the needlepoint and will hang it as soon as I find a nail. My mother was not a crafter but she did work in a hosiery mill and as a result we had lots of loom bands (like for making pot holders) and this was a great activity that we would do together in the evenings just to pass time and talk. My mom made all my clothes when I was little. She also taught me to embroider ( x's mostly) when I was 4. A few years later, she taught me how to sew on her sewing machine. She's 80 now, so she doesn't use her machine much, but she still loves to do embroidery. My mom made nearly all my clothes as I was growing up. I have so many memories of her at her machine.....making me my winter dress coat, royal blue felted wool......making my dresses for eighth grade dances (yes, I am old enough that we wore dresses to the dances! ), she helped me make my wedding dress, adding fake fur to my red winter coat so it went from short to maxi (what was I thinking!). She didn't do any other crafts but she was an awesome baker and made bread a weeks supply of bread every Monday along with sweet rolls. She passed away May 1984 a week after Mother's Day. My mother has an old Sear's Kenmore sewing machine that she used often to make me and my sisters lots of clothes. I remember that every summer we would buy colorful fabrics st the Five and Dime and she would sew us little shorts and tops to wear during the summer. That was so long ago but those are truly happy, wonderful memories. It has to be my mum teaching me to knit when I was 5 or 6 years old. Man, that took some patience ! My mother did not quilt or knot or crochet, but her mother did - and my grandma taught me all of these - I fondly remember the Barbie blankets! My mom and dad have always been DIYers . most of the time with good outcomes. however, when we were teenagers we all decided to tie dye with some paraffin wax. my mother answered the door and my sister and I turned up the heat. there was smoke and the ceiling turned black. My mom was up here visiting about 4 months after I had my 4th baby (she's a teacher and couldn't come up until then!). She had called and said she wanted to make a quilt. So, we went shopping, cut up the fabric (I did a lot), and sewed it up. It took a late night of sewing the night before she left, but we got that quilt top finished before she had to go home. She will still call me to ask for ideas and advice about quilting. It's only fair. I call her to ask questions when I make clothes for my kids. my mother, grandmother and aunt are all extremely talented. they did just about every type of art and craft between the three of them. my grandmother made all of our barbie clothes by hand and they were the most beautiful things i had ever seen. My mom was not a sewer or a crafter but My favorite memory of sewing with my children is helping my 10 year old make a quilt for her friend. My mom loved to knit. When ever she would sit, she would have needles in her hands. My favorite memory is when she was on the federal grand jury. She went once a week and was on it for 3 years. Her knitting went with her every week, and she would knit during the trials. Nobody seemed to care that she did that. She could listen and knit! Turns out, she ended up teaching alot of the others on the jury how to knit. With 4 daughters and a tight budget my Mom made most of our clothes. One year for Xmas we all (Mom included) had red velvet dresses with white fake fur pill box hats. She is no longer with us but we all carry on using the multiple craft skills she taught us. My mother was sort of a 'closet crafter' and my best crafty moments with her were usually disguised through doing school projects - my favorite memory was a giant tree we made for our family tree. She helped me attach three-dimensional pieces to the tree for each family member - leaves and even did creative embellishments for the tree to give it character by adding little flowers and bumble bee felt pieces. It was A-worthy for sure and one my teacher put on display. I think I was a second grader. Anyway, she's no longer here, but memories like that always make me smile. Thanks for such a wonderful giveaway! My mum wasn't a sewer but she loved to knit - she knitted all my jumpers when I was a child! My Grandmother will have to do. She taught me to quilt by letting me work the peddles of her treadle machine. I was just a toddler. We are talking about a very long time ago on a farm with no electricity or running water. She was a dear sweet, tough lady. I miss her every day and of course I still quilt. She would love today's quilters. somehow the crafty gene skipped over my mom - my grandmother however was a world class seamstress. I spent a couple of my high school years with her and she taught me all kinds of needle crafts, most importantly how to sew my own clothes. I still have the first pillowcases that I embroidered under her tutelage...that was over 50 years ago. My Mom was not a sewer or crafter of any sorts while I was growing up. She worked hard full time and then enjoyed her card games with the girls as her form of relaxation. It wasn't until I had my first child and she gave me a handmade knit blanket that I even knew that she knew how to do anything crafty. I treasure those blankets made for both my kids since they represent her little known skills. Miss her lots. My Mom was not a crafter of any kind but I was crafting from birth. My favorite story is that I made her a beautiful, formal red velvet dress for some sort of political function. She was so proud of that dress which still makes me smile to this day! Thanks for the beautiful fabrics! She instilled in my my love for sewing:) I sewed a bunch of clothing for my children and now my daughter sews her own costumes. A legacy for sure! It was my mom who taught me my very first craft and before she died, bought me my sewing machine so I could take up quilting. I will be forever in her debt for instilling this love of handmade things in me. My mum is no longer with us, but she was a great machinist and could turn her hand to almost anything - and without a pattern. She tried many times to teach me to sew, but I never had the patience and so anything I put together fell apart! When she died I kept all her sewing accessories and fabrics and now that I have learned to have patience and can sew (after a fashion), I often use her bits and pieces and think fondly of her when I do and I know she would be looking down and be proud of what I can achieve now. My mom always made my clothes when I was growing up. She also taught me how to sew, which I am sooo thankful for! It was always exciting at Christmas time when she'd lock herself in her bedroom or wherever she was sewing secretly that year, and we weren't allowed to peek. We always got new Christmas dresses. Ten years ago this month my precious mother passed away. She was always so busy working and running the household that she didn't have time to teach me how to sew. She talked my grandmother into teaching me. After that I made not only clothes for myself, but for my mother and grandmother, too. They loved telling their friends that I had made their outfits. I loved that my mom always sewed our Halloween costumes. So special! My Mother went through a huge supply of sewing machine needles...because I was always sneaking in to make my own Barbie doll clothes, sans patterns, when she wasn't looking. She saw my interest in sewing and encouraged me. She taught me embroidery & crochet, probably to curb me from racking up the National Debt in sewing machine needles. As a result, I tend to enjoy adding my own handwork to my quilts rather than going to the machine to embellish. The projects I remember most all involved things we made for my older sister. We used leftovers from her soft pink satin wedding dress and the aqua velvet bridesmaid dresses to make smocked pillows as keepsakes of her wedding by marking dots on fabric then connecting, folding and tucking to make a consistant design. I smile now, as I'm seeing a big resurgance of this sort of smocking in home design lately and my own daughter fondly petting a pillow with similar work that we saw together just the other day. History repeats and what was old is now new again! My mom made dresses for me and my sister when I was little. The dresses were always smocked with cute animals or apples (complete with a little green worm, of course!). As I got older and more interested in crafty things, she helped me sew a wrap-around skirt. Looking back, I understand that I picked a terrible fabric to work with and that my mom did most of the work, but she has always been supportive and done everything she could for my sister and me. Last year, I completed my second quilt, which was my mom's "happy" quilt with all of the bright fabrics that she helped pick out, many with her favorite pattern - paisley! I was so happy to give something handmade to her! My mom wasn't much of a crafter, but my sister and I loved it! I do remember mom letting us go to do ceramics with her occasionally though! My mother and I share a love for handwork...knitting, crochet, embroidery, sewing and cross stitch. I have many wonderful memories of us enjoying and teaching each other these crafts. She is a knitter and told me that at the age of six, while growing up in England during the war, she would knit socks for her and her siblings. She has tried to teach me but I just can't get the hang of it...I love crochet. At the age of 80 she still sews everything by hand, knits, and does the most beautiful cross stitch when her hands allow her to. Even though we live many states apart, when we do get together we always enjoy working on our latest projects together. I just learned to do punch needle and can't wait to show her when she comes to visit in September. Love you Mom! Wow...what a fun giveaway and what amazing prizes! My mom is not crafty... She famously claims her most creative moments involve a vacuum cleaner leaving patterns on the carpet! She has always been such a huge fan and supporter of my own creative endeavors, though, that she has easily become my favorite person to make things for! My Mom is not super crafty, but one of my favorite crafts with my Mom was making Christmas tree trimmings made out of strings of popcorn sewn together. Yikes, that is a pretty bundle. She pretty much let me have time at her machine and I sewed and sewed. She gave me old sheets to practice sewing on. One day I asked her (I might have been 12) to help me make a dress that was different than a pattern. She was very very good at sewing, learned in a sewing school in Holland. So she showed me how to make alterations to patterns, change the bodice, add on a collar, different sleeves. That dress was way different than the pattern and it is still one of my favorite dresses. I do not have the dress anymore but I do have some of the fabric -- just little bits. When I look at that fabric, I think of my mom and how she was so good and taught me so much. She and dad are 90 now and live one mile from my house (camping in an apartment for a few months until their retirement apartment is ready). She had a stroke last year and she is still so strong and determined. I admire that. She was born with only one hand. REALLY! When I was a kid I thought all moms only had one hand. My mom can do anything. She can do more than two handed people. She can type, make Belgian Lace, embroidery, loads of hand stitchery, cook fancy meals, raised 4 kids, speaks 4 languages. She married a prince, my dad. He is amazing. I love my mom and dad and I love taking care of them now. Now I make them placemats and I make my mom little jackets (very fancy) to wear around and look like a classy lady. What an awesome giveaway!!! 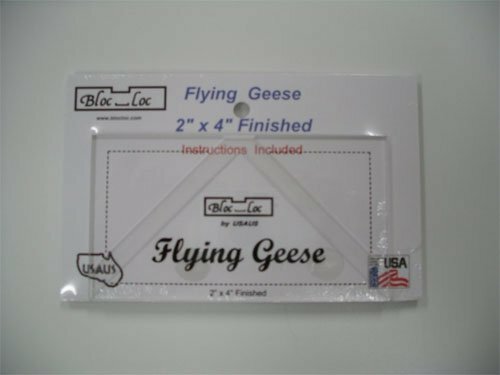 My favorite mom craft memory is crafting those "geese" made out of milk jugs back in the late eighties, early nineties. We must have made dozens of them for friends and family! My first experience with a hot glue gun. That makes me laugh just thinking about those geese. My mother was not a big crafter, she didn't have the time as she worked hard to make sure we had everything we needed. But for Christmas each year we would sit at the dinning room table and make ornaments out of styrofoam balls, sequins, pins and beads. My sisters and I would have fun making a mess and creating over embellished ornaments, my mother's always came out beautiful. I just want to bite that juicey bundle. My mom didnt share crafting with me, I learned to us what we had when we were so poor. and through my life I have a love of upcycling and repurposing items. Now my grandma who really raised me, taught me needle work. I didn't learn any crafting ideas from my Mom. But she did own a flower shop and I learned thing from her at the shop. My mother was left-handed so it was hard for her to teach her right-handed daughter. She didn't do a lot of sewing because she had a full time job at Sears. She did make 2 large cathedral window quilts and pillow shams to match. They were beautiful! My mother, my 2 sisters, and I used to make Christmas decorations together each year. We didn't have extra money to buy decorations, so the hand made ones were special. Thanks! My mom sewed a beautiful skirt for me and I remember watching her make it and wearing it to school the first time! I begged my mother to teach me how to sew as a small child and she allowed me to sit at the machine starting at age 4. I went through fashion design school, became a fashion designer and enjoyed a 20 year career before heading back into home sewing. I now teach sewing to children and adults (both clothing & quilting), all because of my mother's constant encouragement. We still get together to sew and attend crafting and quilting events and workshops together as often as we can merge the distance for the love of our shared creativity. It's so nice to be able to teach each other now. I remember my mom making drawings on Easter eggs with India ink for my friends. She could draw anything and made awesome caricatures for us all. We also did all the cookies and once, a huge wreath made of nuts for the holidays. My mom and I would make Christmas ornaments together each year at our church - we would all do it together and then decorate the church tree. She didn't like sewing, so she gave me her sewing machine when I was a young teenager! I grew up in Minnesota and my mother and I shared a love of sewing--and of getting a good deal! There was a Munsingwear outlet in Minneapolis that would have periodic sales and we would buy fabric and lace by the pound! It was crazy busy so quite the adventure! Thanks for the giveaway! My mom does so many crafting things. I think the first crafty thing I learned from her was painting ceramic figurines. I remember her going to the store to get one and she would let me pick out something small then she would come back home and prep hers with so much care, removing the flashing lines and making sure there was no dust on it before painting. But I have learned so much from her I am so grateful that she encouraged me to craft so much. I don´t have so many memory of crafting together with my mother, as a mother of six children there wash´t enough of time But my grandmother taught me to crochet when I was only seven and also to make some embroidery. My mum was an excellent seamstress and encouraged me to sew along with her. I never liked making clothes and still don't even though I do make them sometimes but I loved collecting cardboard boxes and making curtains and furniture from empty bottles and such. I now make bags and household furnishings and have passed on my passion to my own daughter who is now a Textile and Fashion Designer. My mom bought me my sewing machine and spent a whole weekend with me teaching me to use it and helping me make curtains/valances for 4 different rooms in my house! My mom and I just attended Craftcation together in April. It was an extended weekend of all crafting all the time. So much fun! I am lucky that my 79 year old mother is still with me. She really helped me discover an interest in art by her interest in Rookwood pottery. My Mom is the one who taught me how to sew, about 55 years ago. She showed me how to cut out & hand sew some very simple dresses for my dolls. I ended up making most of my clothes in high school & college with her help. Thanks. My mom always said she was not artistic, but she certainly raved about all of my artistic endeavors! Whether it was oil painting, tole painting or quilting, she very proudly displayed (and bragged about) my pictures and quilts in her home. She was more of an outdoor person, so we spent many vacations backpacking around the Sierra Nevada mountains in Nevada. I still love the mountains to this day and I could happily spend the rest of my life in the mountains. Thanks for the walk down memory lane! My mom did so many types of crafting. I must have gotten that inspiration from her. I loved all the sweaters and clothing that she made for me and my babies. I only wish she had been with me much longer. My mother taught me to sew when I was 8. I made an apron. I lost interest until I was 11 or 12, and she patiently coached me through all my frustrations of putting a facing in a sleeveless dress. Over the years, my mother helped me make many of my clothes, sometimes doing all the ripping as I kept trying to fit in that ruffle or sleeve. When I got married I asked my mother to make me a Sunbonnet Sue quilt from all of the fabrics she had saved over those years from all of the dresses we had made together. She hand-appliqued and hand-quilted a queen-sized quilt for me. It took her over 20 years (using her very precious spare time while raising my two younger siblings and being a grandmother to several grandchildren) to complete it. I cherish every stitch in that quilt. My mum was not, and is still not a crafter. It missed a generation there. However, she creates beautiful gardens, which are patchwork of another kind, which we both enjoy. Although my mother passes 24 years ago I feel her with me all the time when I am quilting. I remember that she always had a quilt on the go and as I Do, she only made them for people in her family. One for each of her 8 children and then weddings, babies. It kept her in the quilting business. One of my favorite memories with my Mom during one of her visits. We were playing in my quilt studio and I started pulling out fabrics in sets of three and asked her which ones I should keep and which ones I should donate for charity quilts. We spent hours going through my stash and remembering the ones that we bought on trips together. It was a wonderful two week visit. She had no idea that she was picking fabric for her next quilt or her choices would have been much more conservative. On our next visit I was putting the binding on the quilt. She took one look at that quilt and commented that she loved all of the colors I picked for "my" quilt and by the way wouldn't it brighten up "her" bedroom. She got more quilts that way! My mom made most of our clothes growing up (supplemented by thrift stores & hand-me-downs). I remember spending hours at the fabric store picking out a pattern and then trying to pick out fabric (which took forever) for a blue & white dress she made me for my birthday. never did anything with mom, crafting, sewing or otherwise. When she died last year, found out she was quilting, but everything went to a stranger. So we had a lot in common, but she had too many problems to have a positive relationship. I learned to sew from my mother the summer of my 9th year. My first project was a peasant top made from an old pillow case. Draw string at the top, two side seams and hem. I was so proud. Over the years I kept sewing with my mothers patient instruction even after she had worked a long day. We made prom dresses, concert choir dresses; in college she advised me on sewing costumes for the Opera Workshop. She encourages me even now to keep learning. This year I decided to learn to quilt and am looking forward to sewing especially for her. My mom could draw pretty well, and when I was young I would always ask her to draw things for me to color. Mostly animals and such. I didn't inherit her drawing skills but definitely inherited her creativity. My mom passed away 2 years ago, but I am so thankful that she always let me use her sewing machine when I was young. My mother taught me how to sew and master all the mysteries of the sewing machine. She also gave me the gift of mastering knitting and crocheting. She could never sit down without having some craft projects in her hands. Her mother, my grandmother, was even knitting socks when she was walking! She had to utilize all the 'transport stretches' in between chores, taking care of the home and all the children. My mother and grandmother and I all made a quilt together. It was supposed to be for a junior English class. I had to make a project representing the 18th century. we worked the entire Christmas break on it, & I got an A. Success on so many levels. My mother bought me a sewing machine 30+ yrs ago in hopes that I would learn to make beautiful things. I remember making her a set of throw pillows and she thought they were so beautiful. My mom passed away a few years later and I never touched the machine again. Now in present day...I learned to quilt about 3 yrs ago and cannot stop. Totally hooked on piecing and making all things quilted. My mom would be so proud of me. She wasn't crafty but she thought there was nothing that I couldn't do. Some great stories here! My mom is not a sewer, but I will always remember her excitement when it came time for Christmas and we set out the luminaries along our sidewalk (just in case you don't know we took paper lunch bags filled the bottom with sand and put a candle inside and at night we would light the candles), it was always touch and go on where we would find the sand, one time I remember us sifting out cat poo, from the sand pile, that was pretty darn gross, but always entertaining. My mom taught me to sew and we still sew together even though she is 91! She does the pressing. I do the sewing! I remember my mom helping me sew for 4H. We sewed on her mother's treadle Singer and I have it today!! My favorite memory of my departed Mom was when we were making skirts and collars out of handkerchiefs among other things to sell at small craft fairs. Beautiful giveaway! I grew up in the time of the Laura Ashley dress being the it thing. We couldn't afford them, so my mom made them for me and let me tell you they were better than store bought! We had the best time choosing the pattern and the fabric. I loved hanging out with her when she made them and I was always so proud of her when I received compliments on them. We did not have much and lived in a car some times. I remember living in one of those tiny trailers one Christmas. We had no money or space for a tree but what my mom made out of foil has stuck in my memory greater than any tree I remember. She cut out a Santa complete with sleigh and a few reindeer and hung it on the wall. I was amazed at her talent. When I brought it up as a sweet memory she just laughed and said, "That silly thing!" I have such great memories of my mom quilting with friends in our basement. She taught me how to sew Barbie clothes and patchwork quilts. She also made so many of our clothes growing up and flannel receiving blankets for her grand kids. She passed away 17 years ago before knowing any of my own kids, but the skills she taught me benefit them all the time! I loved to watch my mother as she made beautiful beaded Christmas tree decorations. She had such a knack for design and color. I still have several of these balls and they are very precious to me. My mom and I used to go on quilty road trips. We'd make up our own shop hops and go driving around to various quilt shops wherever we were at the time. I miss my mom when I go places, because shop hopping with her was way more fun than by myself. I remember my mother teaching me to sew a simple skirt for my doll when I was seven years old. I took to needle and thread like a duck to water, and I am still working with fabric some 50+ years later. I remember mama sewing all of our clothes and especially our Easter dresses! She sewed everything on her little Singer featherweight. I love my little Featherweight and the memories of mama it sews up for me every time I make something. My mom sewed me a purple dress when I was younger - I absolutely loved it. My mom taught me how to sew. I think it was Girl Scouts that we had to do a sewing project. Others thought we cheated because our T-shirts actually had ribbing around the neck and armholes. Everyone thought that was too advanced for a beginning project. Since my mom and grandma always sewed, it seemed normal to me! Never did take to the garment sewing, but I love quilting. When I told my mother in 1978 that I wanted to make a quilt, she looked at me like I was nuts. Then sher said, "You could make one, "but how would you get it quilted? I don't think there are any ladies' church groups that do that anymore." I was determined that it was possible to quilt it myself--without a huge frame even--and by golly it was! HI, oh memories flood my mind: the little 8x10 cotton ABC sampler that she helped me to do is a precious memory! From them on I was smiiten with threads! Thank You Mom! Thank You Melissa for sharing! My mom won a sewing machine in the state fair for a dress she made me. She gave me that sewing machine and taught me to use it. My Mom has always been making things of one kind or another. She almost always has something in her hands. When I turned 16 my special gift was a porcupine quill necklace that had a rose with beads "woven" into it. They're really just strands of beads, but when they're next to each other the rose pattern emerges. I really love it. My mom, when I was only 5 years old, made my aunt's wedding dress. That dress hung on a little hook from the ceiling of our house for weeks while mom sewed on it and finished it. I could not believe such a fairy tale dress was coming to life right in my house! Then I became a flower girl in the same wedding and she made my dress, too. My Mother Passed away before we could have time to Craft and Quilt Together. She did help me buy my first fabric for a Rail Fence Quilt when I was in HS. I miss her every Mother's day and try to make Homemade Christmas gifts for my Grandchildren to remind them of her. She did Knitting and Crocheting more than Quilting. My Grandma and Her quilted in our living room and I got to thread the needles when I was real young. I haven't thought about that dress in a long time. I wonder if she still has it? My mother was a self taught seamstress and did a wonderful job making all of my clothes. I have wonderful memories of her teaching me to sew for 4-H projects. I have deep appreciation for her giving me the foundation in sewing techniques which have grown into my passion for quilting!